Recruitment and retention of patients for clinical trials is becoming increasingly difficult for pharmaceutical sponsors and their CRO partners, as a variety of trends conspire to depress enrollment rates and render traditional modes of recruitment ineffective. The digital revolution has opened new opportunities to identify, reach and engage potential trial participants directly. 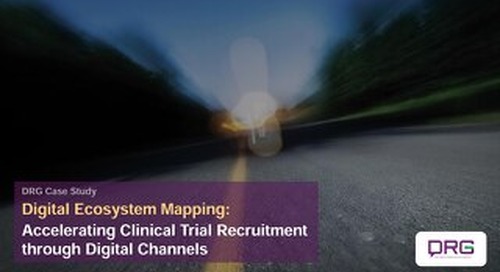 New approaches offer the potential to improve enrollment and retention rates and point toward a new patient-centric model of trial recruitment and engagement. In this webinar, Mariana Servin, DRG Digital’s Senior Director of Digital Innovation Consulting, discusses the opportunities that cutting edge digital methodologies offer for solving trial recruitment and retention challenges in the current competitive landscape.